Weckerly Farms is a family business in the sense that our family owns and works within the operation. We are also a family business in the respect that we value our employees and their families as part of our own. We are a unique company to work for because we are willing to go the extra mile for our employees, whether that means helping a new employee and his family relocate, or offering benefits like retirement planning (including matching contributions for long-time employees). Whatever the situation, if a member of our crew is a dedicated and successful worker, we see to it to do the best by that person that we possibly can. 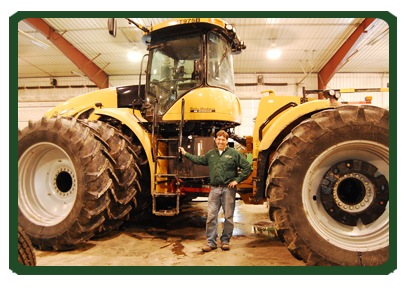 We are seeking a qualified and experienced equipment operator with a strong mechanical skill set. The specific job description will vary depending on the applicant's abilities. Winters are spent reconditioning machinery for the upcoming production season. Spring is spent with tillage machinery, air seeding, and corn planting. Summer will have some employees spraying crops and others reconditioning machinery and getting grain storage ready. The fall brings harvest, field preparation, and fall fertilizing. The right applicant will have experience in production agriculture, working on and operating a variety of farm machinery, be familiar with technology and have a solid work ethic. The custom applicator position will include spraying, fertilizing, soil testing and possibly other farm work depending upon the applicant. Equipment operating skills and general crop knowledge are required. Candidates should be reliable and quick to learn. To apply for a position with Weckerly Farms, contact Chad at (701) 793-7382 or complete our online job application. Online Employment Application: Please click here to fill out our online employment application.